Khasab Hotel ... another striking project in Al Ansari’s portfolio. The Gulf region is quite rich in building design, with key cities in the region surpassing their peers in architecture, design, grandeur and class, according to a senior official of Al Ansari Trading Enterprise, one of the biggest construction groups in Oman. A key aspect of this rich architecture is the use of natural stone which accentuates the class and grandeur of structures and highlights the taste of the developer and architects. And while the use of stone does add to the cost, the region nevertheless accounts for more than a fifth of the global market for natural stone, says Adnan Nalwala, the executive director of Al Ansari Trading as well as Natural Stone Company, Al Ansari’s joint venture with Bahrain’s Bramco. Quoting Ventures, a project tracker, Nalwala says the $5-billion natural stone market in the GCC represents about 20.83 per cent of the $24-billion global market for natural stone. He anticipates that with numerous projects in the construction or planning stages, the demand for natural stone will continue to rise. Nalwala ... focus on contractors. “Many of Dubai’s hotels even outshine the palaces of emperors of the ancient and medieval periods. Burj Al Arab, Royal Mirage Hotel, Westin Dubai, Atlantis The Palm, Ritz-Carlton DIFC, Madinat Jumeirah in Dubai, Sheikh Zayed Grand Mosque, Emirates Palace Hotel and St Regis Hotel in Abu Dhabi, are a few good examples where marble and natural stones have been crafted well into the overall design of the buildings, says Nawala. Registered as an “excellent grade” company with the Tender Board of Oman and certified to ISO 9001:2008 quality standards, Al Ansari Trading has a state-of-the-art natural stone facility in Oman, which is one of the largest of its kind in the sultanate and the UAE, offering a high quality stone supply and architectural design, with access to a network of quarries, skilled craftsmen, artisans and advanced technology tools. Spread over 25,000 sq m at Sumail Industrial Estate, Natural Stone Company has accomplished complex installations of marble and stone works at dozens of mosques, palatial buildings, and commercial and residential projects. 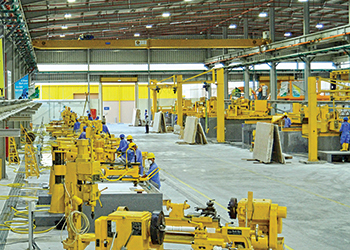 It is equipped with all modern and robotic computerised precision-controlled machines such as a five-axis CNC (computerised numerical control) stone working centre, six-axis diamond-tipped wire saw, 80 blade gang saws, double- and single-head water jet machines, block cutters, bridge cutters, edge cutters, polishing machines, gantry cranes, electric overhead travelling (EOT) cranes, recycling of offcuts, water recycling unit and modern dust arresters. 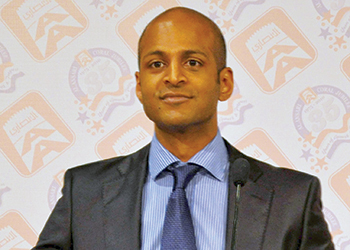 Sustainability is also at the heart of its operations, Nalwala says. Natural Stone Company has adopted the use of modern dust collectors to tackle dust pollution, LED (light-emitting diode) lighting to save electrical consumption, a recycling plant for the water used in the quarrying process and also the leftover stones to create pebbles. 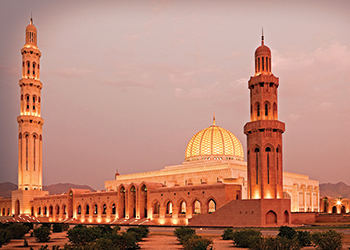 The Sultan Qaboos Grand Mosque ... a key project for Al Ansari. 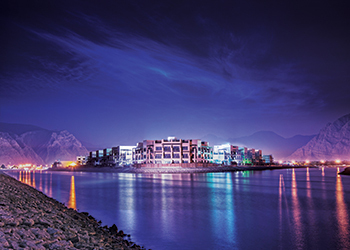 The company has worked on a variety of architectural landmarks of the Middle East, having delivered prestigious projects such as Sultan Qaboos Grand Mosque, Majlis Oman, the Supreme Court, Royal Opera House Muscat, Sultan Taimur Bin Faisal Mosque and Khasab Hotel in Musandam, all in Oman. It has also supplied natural stone to projects in the UAE such as Jumeirah Beach Residence (JBR), Business Village, Dubai Marina Promenade, Four Seasons hotel, Al Amal Hospital, Crown Prince Court Abu Dhabi, the VIP entrance at the Grand Mosque Abu Dhabi, Fujairah Hotel, and many more. Nalwala points out that stone has found a place in various applications, such as construction, interior decoration, monument and memorial artefacts and landscaping. Although traditionally associated with expensive and opulent spaces, marble is today used in various applications – from five-star hotel bathrooms to a simple coffee table top, he says. “The demand is clearly driven by the innovation and awareness created about the longevity of the product – both from the perspective of durability and embodied environmental impact – and especially due to the desire of both designers and consumers to work with natural and raw materials. “Moreover, designers like the aesthetically-pleasing, open look large natural stones give floors and walls in residential and commercial applications. Consumers like the natural beauty of a large stone expanse and appreciate the easier maintenance resulting from fewer grouted joints,” he adds. But large-format tile also has its installation challenges. Working with large-format stone requires tighter tolerances in the substrate. In addition, its weight makes it harder to handle in both floor and wall applications. Although wood is typically considered a natural material that scores the highest points for sustainability, natural stones like marble and granite have some impressive credentials of their own, Nalwala points out. “Yes, stone can last a lifetime too, meaning a floor does not have to be replaced every few years, therefore not impacting on the Earth’s resources (and ultimately saving money), but two factors need attention: good care and correct installation,” he says.